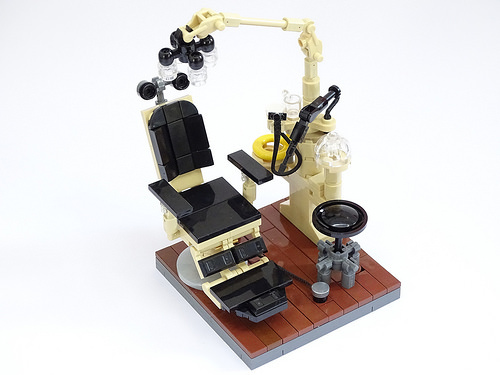 The Brothers Brick features many LEGO models created during build challenges like “Iron Builder” and the “ABS Builder Challenge.” Lucky builders get mailed “seed” pieces and are asked to create a series of wonderful, amazing designs in a short period of time. As luck would have it, Brick Samson (aka yours truly) was invited to participate in the ABS Builder Challenge round 2.8. After an inspirational chat with a friend about the seed part (the dark brown wheel arch fender looking thing) and the narrow leather recliner was born. Add a suitable gaudy tiled floor, sterile white walls and cupboards, appropriate fixtures and a few lethal instruments and you have a squirmy colourful scene to send a shiver down the back of your spine. Enjoy!